It is said that long ago, when the mists covered the world and all creatures lived in harmony, none hunting the other, that there lived a beautiful raven and a strong, powerful wolf. The raven would come out each night and soar in the moonlight because she liked the way the reflection of it played on her dark wings. The wolf would roam at night because he liked the smells then the best. One night as he was roaming a shadow passed over his head and looking up he saw the most beautiful sight he had seen in his years roaming the forest, a beautiful black bird was soaring back and forth across the moon. The raven felt eyes watching her from below and looked down and into the adoring amber eyes of the wolf. Intrigued, the raven flew down to where the wolf stood on a cliff just out of the woods and lit on the ground beside him. “I am called Raven.” she said in her melodious voice. “I am called Wolf.” the wolf said in his deep, velvety voice. Having introduced themselves they frolicked and played all that night only heading home when light began to paint the sky. Night after night they met. First, they became friends. Then they fell deeply in love. 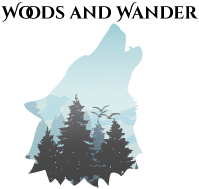 The wolf would dreamily talk of roaming the forest at night and how wonderful the smells were and how many night creatures he had met hidden within the trees. The raven would whisper in rapt tones about the freedom she felt when she soared across the sky. How beautiful the moonlight was when it shined on the water and on her wings. Finally, a day came when the wolf asked the raven to stay with him always and roam the forest. He said, that if she truly loved him, she would give up her wings, turn her back on the skies and come with him. The raven had tears in her eyes when she told him that if he loved her, he would grow wings, leave the forest behind and soar the skies with her. They stared at each other for a long time, both thinking of a life with the other and without what they loved most about they lives they currently led. And each begun to cry, for they knew they could not give up what made them who they were to follow the other, for in doing so, they would become someone else. They spent the rest of that night nestled together in silence. And when the sun began to paint the sky, they looked one last time at each other and the wolf turned and ran into the forest, and the raven took to the skies. And that is why on clear nights when the moon is full, you hear the mournful call of the wolf and the answering cry of the raven.